We Are the Song: Hymns of Gratitude and Belonging. 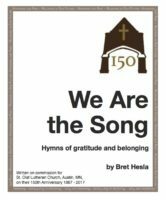 This is a collection of seven songs written on commission for St. Olaf Lutheran Church in Austin, Minnesota for their 150th anniversary, 2018. Click to view separate songs. Purchase songbooks below.